Artwork: Interior illustrations by Todd Cameron Hamilton, maps and ornaments by Ellisa Mitchell and John M. Ford, maps by Thomas Canty, cover illustrations by Darrell K. Sweet, and book and jacket design by Michael Mendelsohn of MM Design 2000, Inc. This book has received a great deal of criticism regarding the quality of its artwork. While the text and maps are valuable and of good quality, a certain number of the illustrations are a bit on the amateruish side, and not at all what one might have expected. The text has come under fire as well, but it is important to point out that while the book does summarize information already presented in the Wheel of Time novels, it also contains a significant amount of new material. 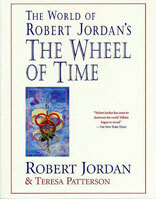 After finding a discrepency between this book and one of Jordan's Question of the Week answers at the Tor web site, it has come to my attention that this book contains intentional misinformation, and that author Teresa Patterson was sometimes forced to make up material herself when Jordan refused to answer specific inquiries. The result is what would happen if a historian in the WOT universe were writing a history bookthey would be forced to make educated guesses based on the incomplete material they had at hand. As such, if any material in the main sequence books conflicts with this guide, then the guide is quite possibly wrong. That is unless Jordan is placing inaccurate information in his books as well.